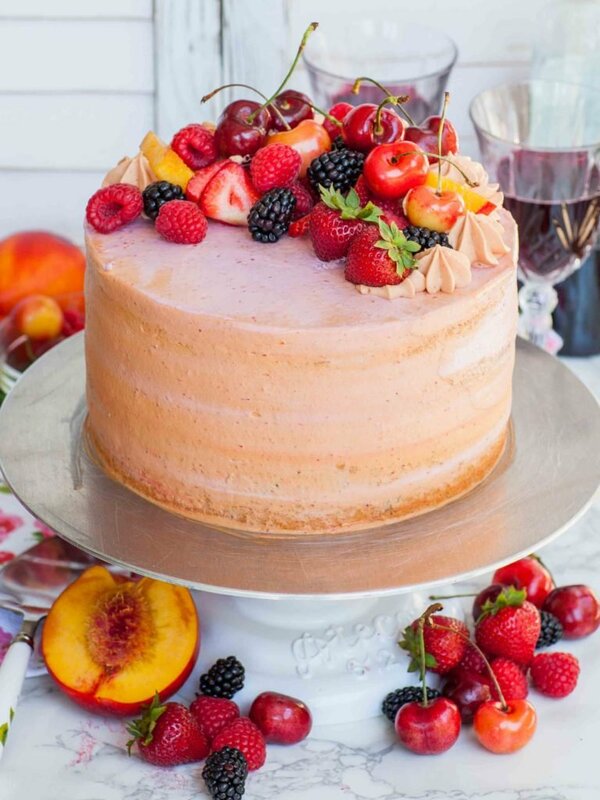 Enjoy your summer fruits and sangria together in cake form! 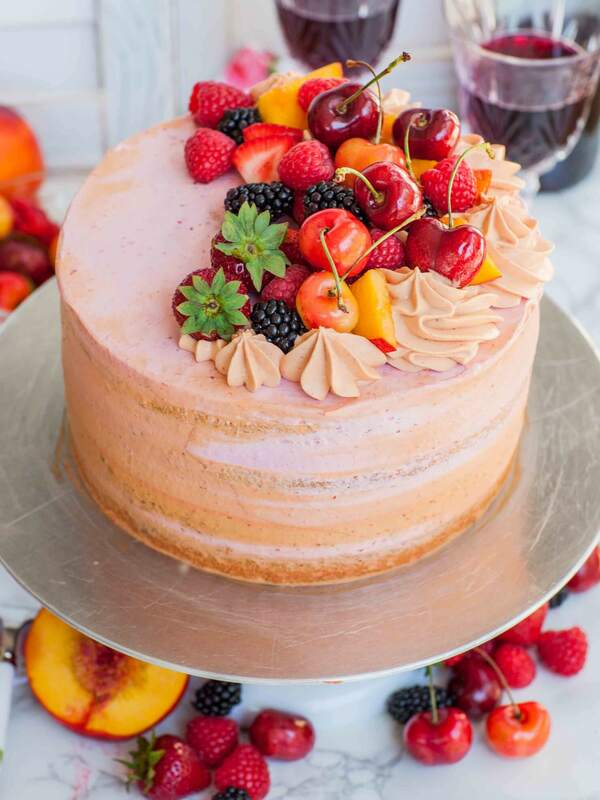 This summer sangria cake is packed full of juicy, sun-ripened fruit and, you guessed it, sangria! 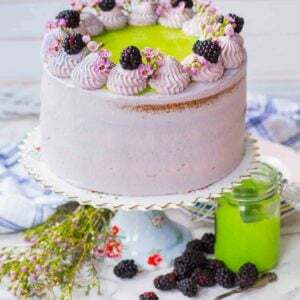 This fruit cake recipe is made with light sponge cake layers, soaked with fruity sangria, frosted with a fluffy berry whipped cream frosting and packed full of fresh fruit and berries! This sangria cake is so light, fluffy and has just the right amount of sweetness to take you off your feet! 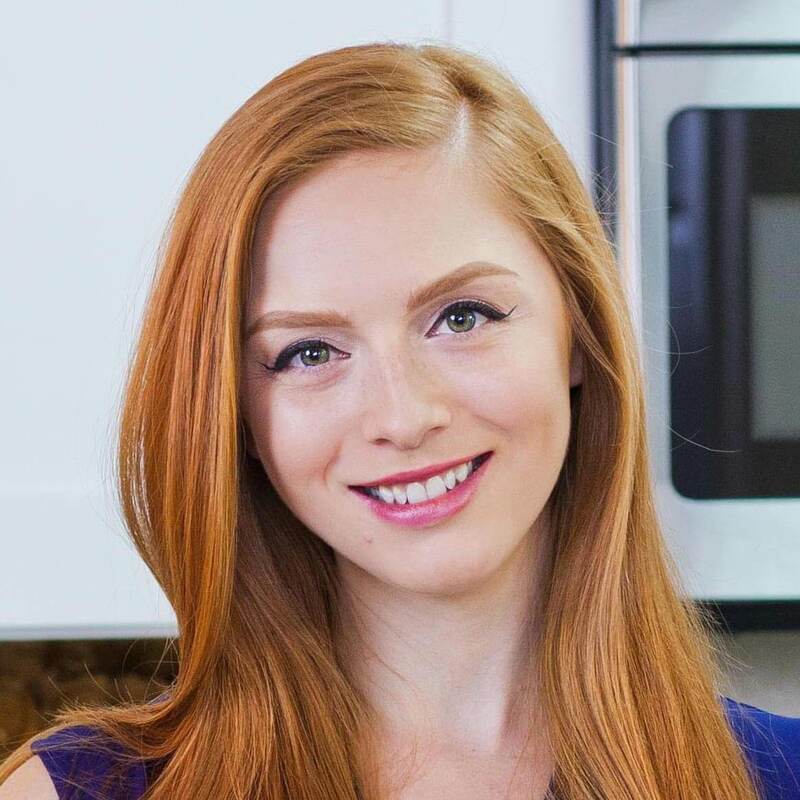 Watch my video recipe for my step-by-step instructions! Want new recipe updates? Make sure you’re subscribed to my YouTube channel! You’ll be enjoying this fruit cake all summer long once you try it! 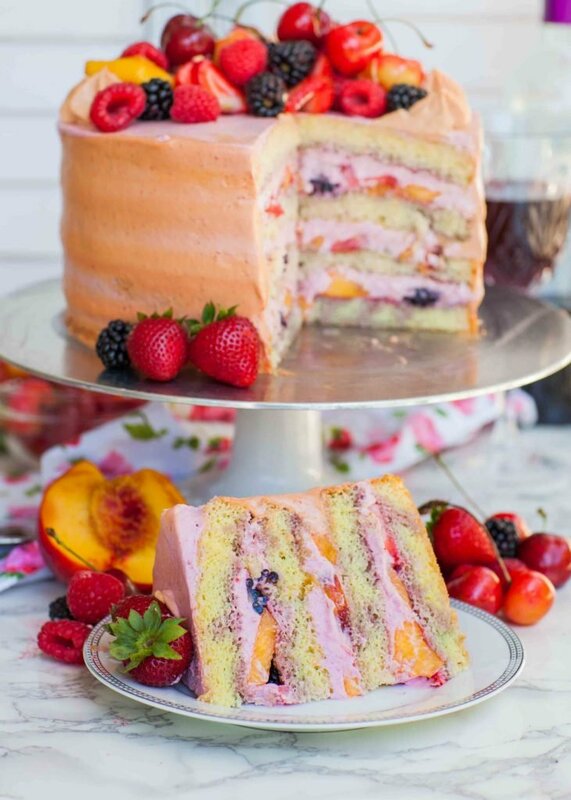 I make the cake with super light and fluffy sponge cake layers, then soak the layers with sweet sangria wine. This wine isn’t too strong or overwhelming, making it perfect for adding to desserts like this one. 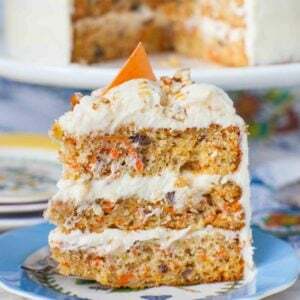 If you want a non-alcoholic version of this cake, just grab your favorite fruit punch or fruit juice. I fill the cake with loads of fresh fruit – nectarines, cherries, strawberries, raspberries and blackberries. Feel free to add your favorite fruits! If you like it in your sangria, add it to this cake! And for the frosting, I went with my berry whipped cream frosting. 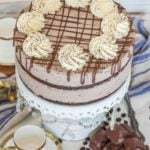 It’s my favorite whipped cream frosting and it’s perfect for this cake! 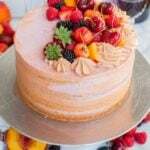 I love using my basic sponge cake recipe for this sangria cake because it’s the ideal base for the sangria. 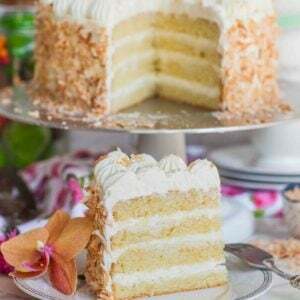 Sponge cake is always dry, but super fluffy. It absorbs liquids very well, so you can infuse it with just about anything. 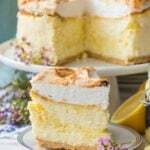 Making perfect sponge cake layers can seem intimidating but if you follow these steps, you’ll be a pro from your first try! Whisk the eggs and sugar together until the eggs are thick and pale. The longer the better! The mixture needs to be almost white in color. If you have a stand mixer, it will be your friend for this step. You have a hand mixer, it will take a bit longer but your arm will get a good workout! Reward yourself with an extra slice of cake! Sift the flour into the egg mixture in very small batches! I use 1 cup flour for this recipe and I sift the flour in about 4 parts. Fold the flour in using a spatula and always scrap from the bottom, gently folding the flour in after each addition. Do not mix the batter vigorously! Fold gently but thoroughly. Do not spray the sides of your pans with spray! Just line the bottom of the pan with parchment paper. Bake the layers until the tops are a rich, golden brown. If the sponge cake is underbaked, it will fall flat once you take it out of the oven. Allow the cake to cool in the pan. Once you take the layers out of the oven, run a knife along the edge of the pan to release the cake, then let it cool. 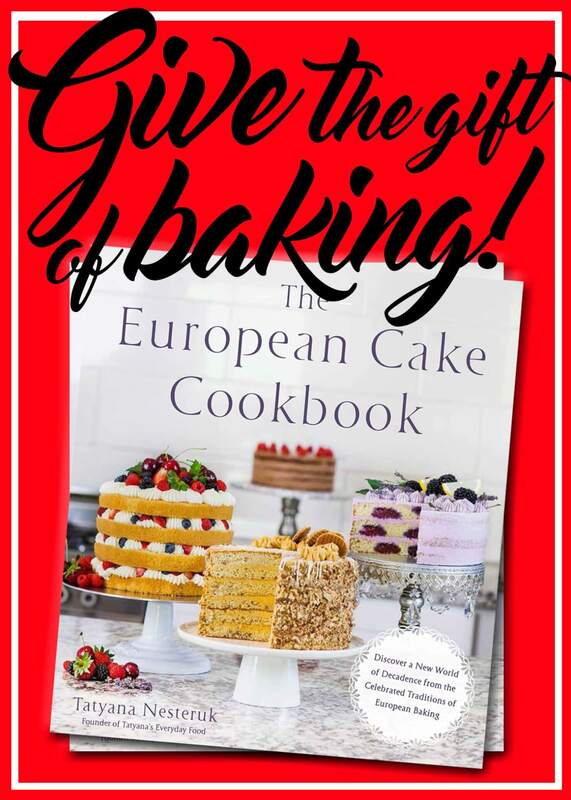 And, you can watch me make my sponge cake recipe on my YouTube channel! I’m head over heels in love with my ‘Berry Whipped Cream Frosting‘! It’s dreamy, creamy and absolutely delicious! It holds its shape very well, making it easy to pipe and frost any cake. For my sangria cake, I made the frosting with raspberry sauce, just like in my original video recipe. Watch my video recipe for the step-by-step instructions and get the recipe below. Looking for more fruit cake recipes? Try my ‘Domed Fruit Trifle Cake’ next! I love the fun shape of this cake! This classic KitchenAid stand mixer is a must in every kitchen. I love these aluminum round cake pans for baking the cake layers. These pre-cut parchment paper rounds are a huge time-saver in the kitchen. And use this set of jumbo cake decorating tips to finish the cake. Prepare the sponge cake first. Preheat the oven to 350F and line 2, 8-inch cake pans with parchment paper; do not grease the sides. In a stand mixer bowl, combine the eggs, sugar and vanilla. Whisk on high speed for 7 to 9 minutes, until the eggs are thick, pale and almost white in color. Combine the dry ingredients in a sifter and add the dry ingredients in small batches to the batter. Use a spatula to fold the flour in gently but thoroughly, folding from the bottom of the bowl. Divide the batter evenly between the two pans. Bake in preheated oven for 19 to 21 minutes, until the layers are a rich, golden-brown. Remove from the oven and run a knife along the edge of the pans, to release the cake layers from the sides. Allow the cake layers to cool completely in the pans. 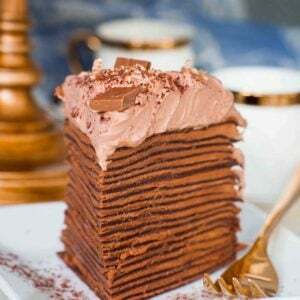 Once cooled, use a long, serrated knife to split the layers in half, creating 4 layers total. For the frosting: Prepare the berry sauce first and allow it to cool before using in this recipe. A hot berry sauce will cause the whipped cream to melt. Combine the raspberries (or other berries) and sugar in a small saucepan. Use a spoon to crush the berries; if using strawberries, dice them before cooking. Bring the berries to a simmer over medium-high heat and simmer for 4 to 5 minutes, until the berries are falling apart. Pour the resulting sauce into a fine mesh strainer arranged over a bowl. Use the back of a large spoon to press the sauce through the strainer, discarding any seeds and pulp. Allow the sauce to cool in the refrigerator. To assemble the cake, first soak each sponge cake layer generously with the sangria. I like to use a dispenser bottle to make this easy. 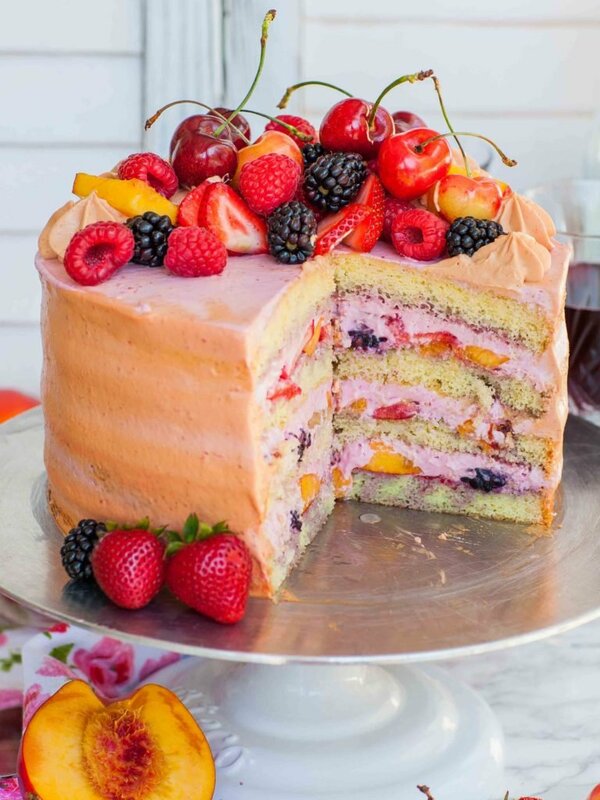 Top the cake layer with fruit, arranging it in an even layer. Frost the bottom of the next cake layer, then invert it on to the fruit. Alternatively, you can add the frosting right onto the fruit but take care that the fruit doesn't slide around. Frost the top and sides of the cake with the remaining frosting. If desired, add yellow and pink food coloring to the frosting to create a peach colored frosting. Add dollops of cream on top and garnish the cake with more fruit and berries. Place the cake into the refrigerator and allow it to set for at least an hour, or overnight. This looks delicious. Just out of curiosity, do you think soaking the sponge cake with sangria is better than baking the cake with the sangria already added into it? Yours is the first recipe I think I’ve seen where the sangria is used after baking. The link to print the recipe looks like it isn’t activated. Was hoping to try this recipe tomorrow. So sorry! Thanks for letting me know; I’ll look into it right away! Hi Tatyana love this recipe. Very creative . What can I use to subsistute the white chocolate chips ? I guess dark chocolate would change the colour . The person I’m making the cake for does not like white chocolate .Can I use white candy melts or wouldthat mess up the flavour of the cake ? Hi! White candy melts would work just fine, too. The white chocolate doesn’t really add flavor, it’s more for stabilizing the cream 🙂 Enjoy! Hi..can u tell me what i can substitute the sangria with? Since i dont want to alcahol pls? Lovely looking cake! Is it possible to make this cake in a hot countrie? (Hot I mean like 40c degree heat.) And also that “hot countrie” is one I’m traveling too, which by plane is two hours away, so what do u think is the best way to transport essential equipment and ingredients? Thanks! And don’t worry if u don’t know the answers to these questions either! Hi Tatyana! My cake turned out great, but my frosting not so much! 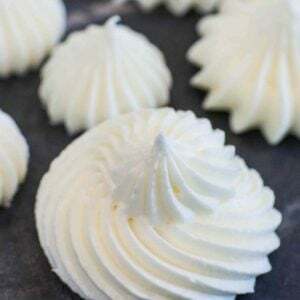 I had stiff peaks of the whipping cream, then once I added the cream cheese mixture it lost stiffness and became runny! What do you think I did wrong? Hi Kathy! I’m so sorry to hear that! Once you add the cream cheese mixture, you need to mix for maybe 30 seconds to 1 minute, depending on how powerful your mixer is. It’s really important that the frosting isn’t overmixed. Hope that helps for next time. Hi there! 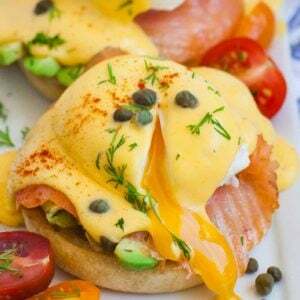 I am very excited to try this recipe.. it looks delicious!!! I was wondering how long the cake lasts. Does is stay good for 3-4 days? Do you find that the sponge cake gets mushy after a day?